You are sure to stop a passersby in their tracks with the visual lines of this display. This asymmetric back wall kit is custom printed on stretch fabric material. When setting up the back wall display graphics it is a pillowcase banner that fits snugly over the frame to create a seamless and eye catching display. Create more visual interest by using this angular display which can be rearrange to your liking. 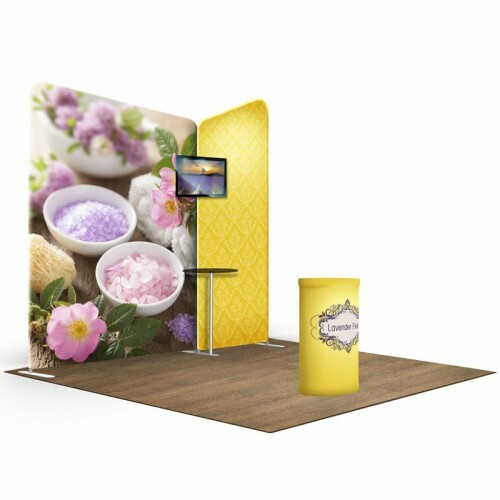 This booth kit is great for a 10 x 10 booth space. The tubular frames are made from aircraft grade aluminum. This kit is great for trade shows, special events, or as an indoor promotional display. You are sure to stop a passersby in their tracks with the visual lines of this display. Monitor Mount - can support up to 10lbs.